1,000 Sound Effects to Save The World...Or Destroy It! Heroes & Villains is a collection of 1,000 high definition sound effects to save the world… or destroy it! Created at the Detroit Chop Shop and personally designed by Ric Viers (author of The Sound Effects Bible and The Location Sound Bible), these sound effects will give any production a super-powerful soundtrack. This collection includes cityscapes, hideouts and laboratories ambiences, various weapons, impacts, crashes, explosions, vehicles, robots, super powers and tons more! Every sound effect was recorded in 24-bit/96kHz and delivered as broadcast wave files complete with comprehensive metadata compatible with your favorite search engine. 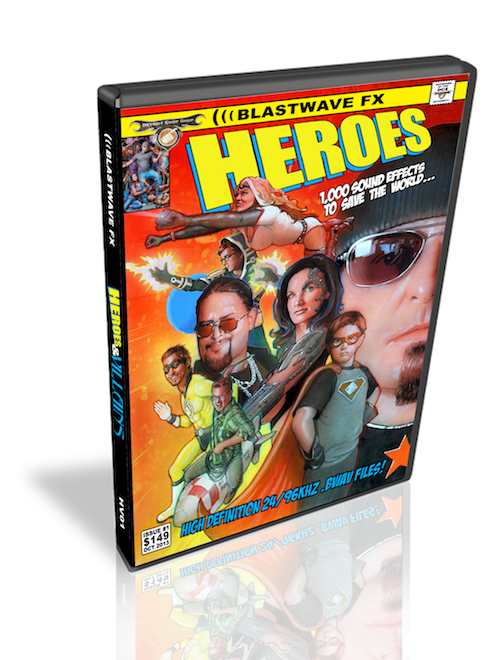 Save the world or destroy it… with Heroes & Villains from Blastwave FX! Heroes & Villains is also included in the Hybrid Expansion 1 Library.